The musical "Oklahoma!" first charmed audiences on Broadway 75 years ago. And the appeal of the works of Rodgers & Hammerstein has never faded since. 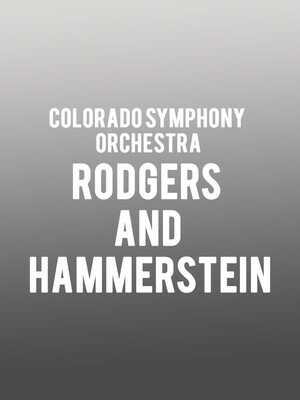 Why See Colorado Symphony Orchestra - Rodgers and Hammerstein? Perhaps the most prolific, influential and successful writing duo in the history of American music, Rodgers and Hammerstein ruled the Great White Way with hit after show-stopping hit, launching the golden age of musical theatre in the 40s and 50s. Commemorate the lasting legacy of these two musical geniuses during the Colorado Symphony's Rodgers and Hammerstein concert celebration, featuring the showbiz tunes that made them, as well as other hit tunes written with the likes of Jerome Kern and Lorenz Hart. Together with the symphony, a host of special guests including celebrated soprano Sarah Jane Mc-Mahon and Broadway performers Gary Mauer and Willam Michals are set to take to the Boettcher Hall stage for a nostalgia-filled, one-night-only program, performing bonafide Broadway classics like The Sound Of Music's 'Climb Every Mountain', South Pacific's 'Some Enchanted Evening' and the main theme from 'Oklahoma!'. Sound good to you? Share this page on social media and let your friends know about Colorado Symphony Orchestra - Rodgers and Hammerstein at Boettcher Concert Hall. Please note: The term Boettcher Concert Hall and/or Colorado Symphony Orchestra - Rodgers and Hammerstein as well as all associated graphics, logos, and/or other trademarks, tradenames or copyrights are the property of the Boettcher Concert Hall and/or Colorado Symphony Orchestra - Rodgers and Hammerstein and are used herein for factual descriptive purposes only. We are in no way associated with or authorized by the Boettcher Concert Hall and/or Colorado Symphony Orchestra - Rodgers and Hammerstein and neither that entity nor any of its affiliates have licensed or endorsed us to sell tickets, goods and or services in conjunction with their events.